My article below appeared in the June issue of Hill Country Happenings.. Click here for more articles and information about happenings in the Texas Hill Country. 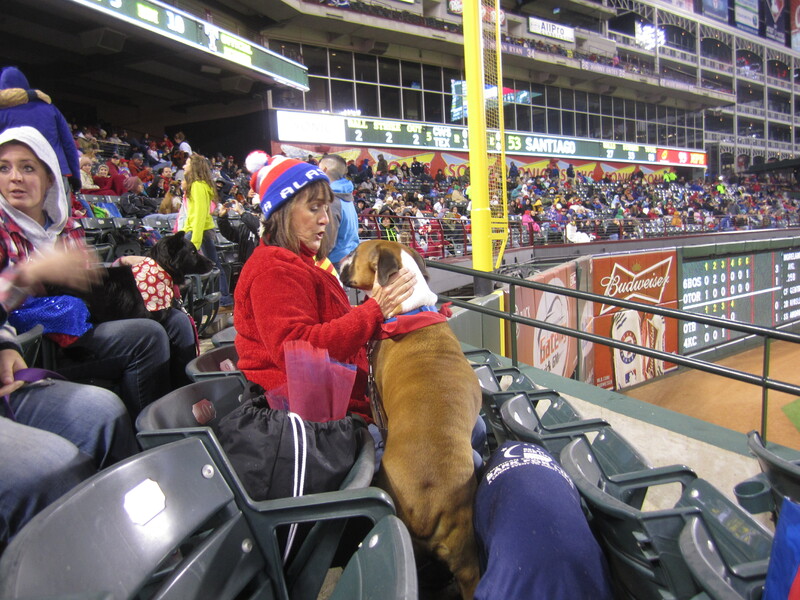 What better way to bond with one’s dog than at a Major League Baseball game and that’s exactly what we did last month! 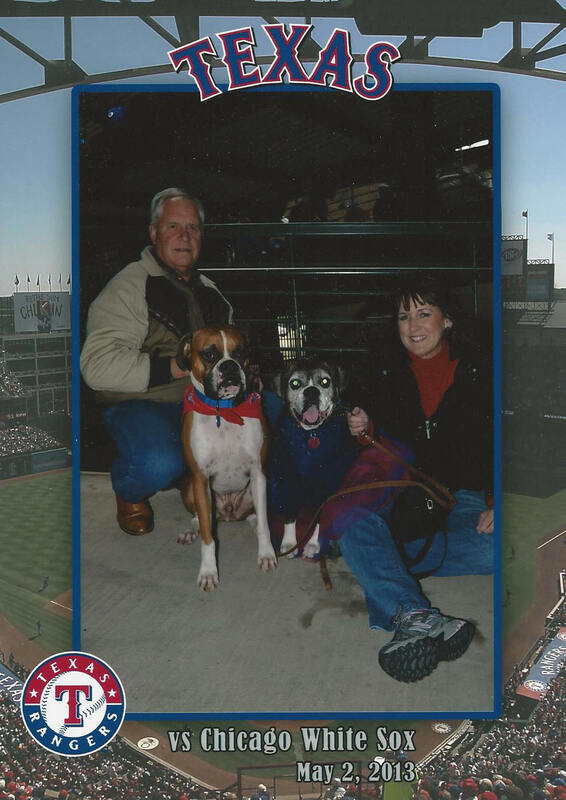 While watching one of the Rangers games, I just happened to catch the promo for their annual Bark in the Park and the next thing I knew I had tickets for my husband Rick and me, along with our two Boxers, Roxie and Rex. The itinerary showed a starting check-in time of 4:00PM. “The game doesn’t start until 7:05PM!” pointed out Rick. 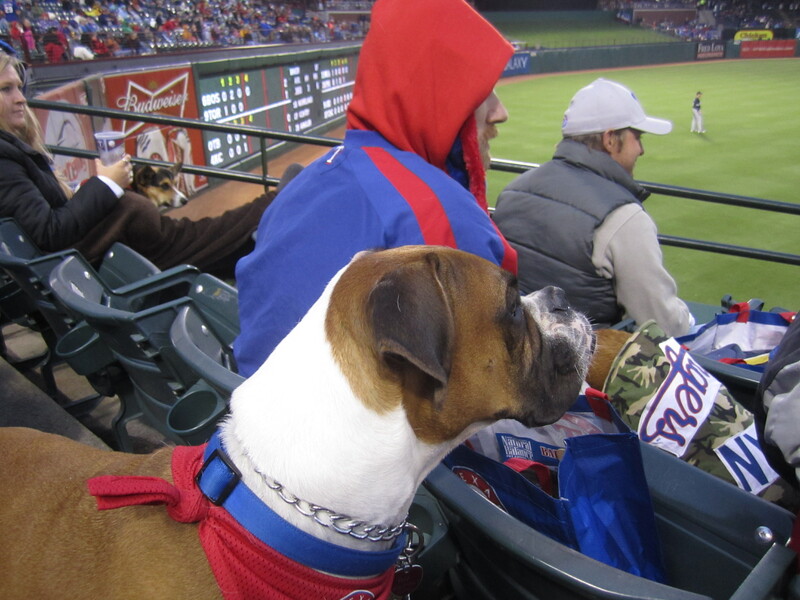 “Well, we can’t miss the costume parade and the pre-game ceremonies,” I replied as the dogs looked back and forth at us. The next thing Rick knew, he was hand-stitching a blue and red tutu for Roxie and I was ordering Rex a Ranger bandana. “Seize the moment…” I always say. Now you’d think a game in May would be a “safe” weather time. Not this year. It just happened to be one of the coldest and there we were at an outdoor baseball game! When we got to the stadium, an orderly line of owners and dogs was already forming at a white canopy at one of the entrances. Being with Rex in public can be like holding a three year old at a funeral. For Roxie & me, it seemed like an eternity to get from the parking lot only a block away. Rex was pulling Rick and being a good “parent,” Rick was patiently correcting him and doing circles to get him in control. Once at the ticket pick-up, I was handed six tickets and two goodie bags each containing dog food samples, a bowl, a blue bandana, coupons for dog food/ treats and a cardboard fan. We didn’t get a whole lot of use out the fans what with temperatures in the low forties with a thirty mile an hour wind. We were directed to an inside ramp which became our “home” for the next hour and a half. We camped out on the second level in a formed line which turned out to be multitudes of levels of owners and dogs! 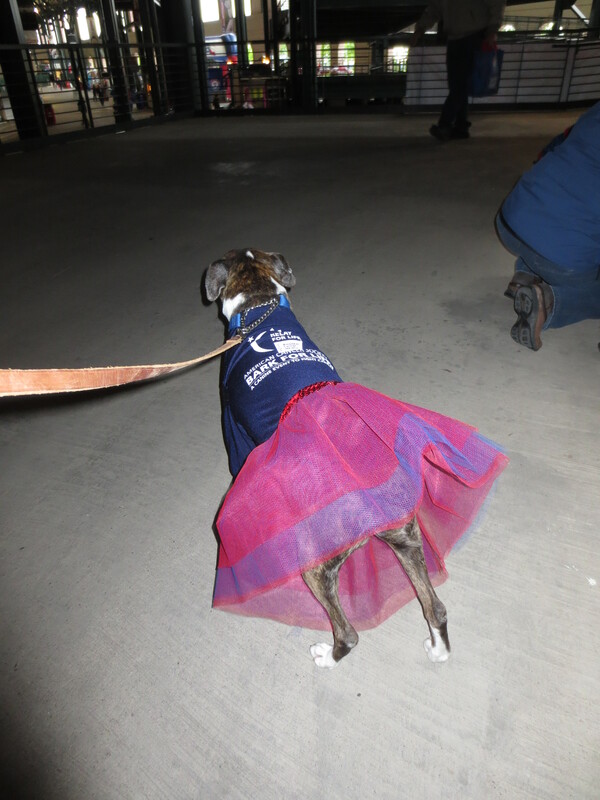 Rex proved to be a “chick magnet”, especially when the Rangers’ wives came by as they pre-judged the costumes for the parade. Roxie is so calm she’s almost boring and she found a friend in a cute young English bulldog next to us. I was glad to be on the second level as we got to see almost all the creative costumes as the dogs headed to the higher levels and more importantly, it was close to the ladies’ room. almost a letdown when neither dog did anything. And according to #Rangers Ballpark on Twitter, of the six hundred and eighty-nine dogs at Bark in the Park, only one soiled left field. 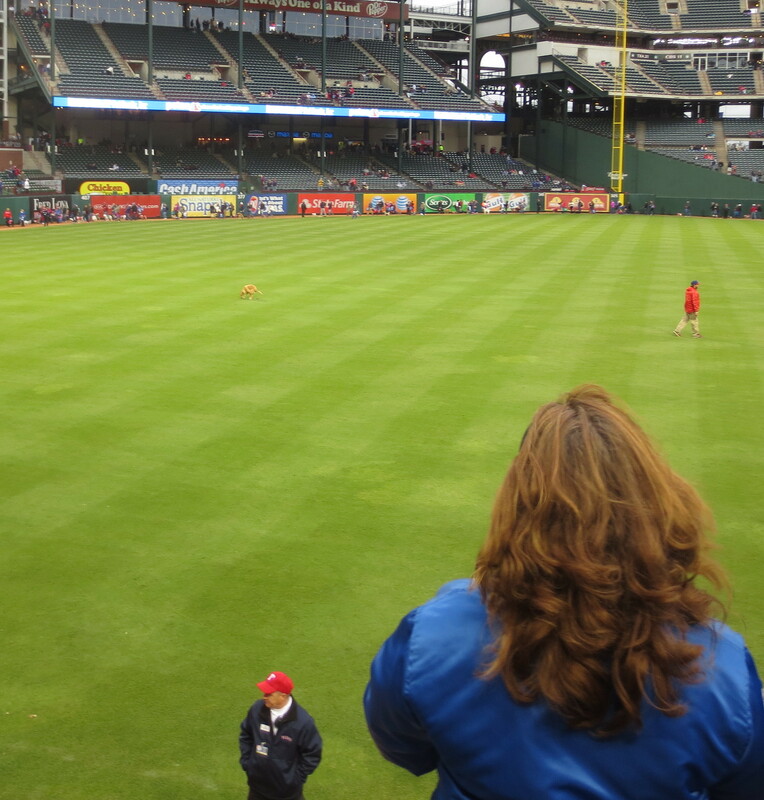 Actually, we were already at our seats and it was a mixed lab that had slipped its collar and must have felt that center field was a perfect place to relieve itself. Within moments, several pooper scoopers and the mortified owner surrounded the dog. Needless to say, it was a Kodak moment for the Jumbotron as well as my camera! Oopsie!!! Clean Up!! Center Field!!! Is he going to throw me the ball? Rick and I took a seat at each end of our block of seats leaving the area under the four folded-seats open for the dogs. Rex and timid Roxie joined in barking with other dogs in the area as the crowd cheered. As the Rangers pitcher was being announced, the hotdog man proceeded down our aisle. When he chanted, “Hotdogs! Get your hotdogs!” Rex’s short yaps changed into a gurgling howl. Everyone burst out laughing and as the vendor passed our row, he looked back at Rex and sang, “There’s none for you man…” A dejected Rex sighed and sat down. Is the hotdog man returning? 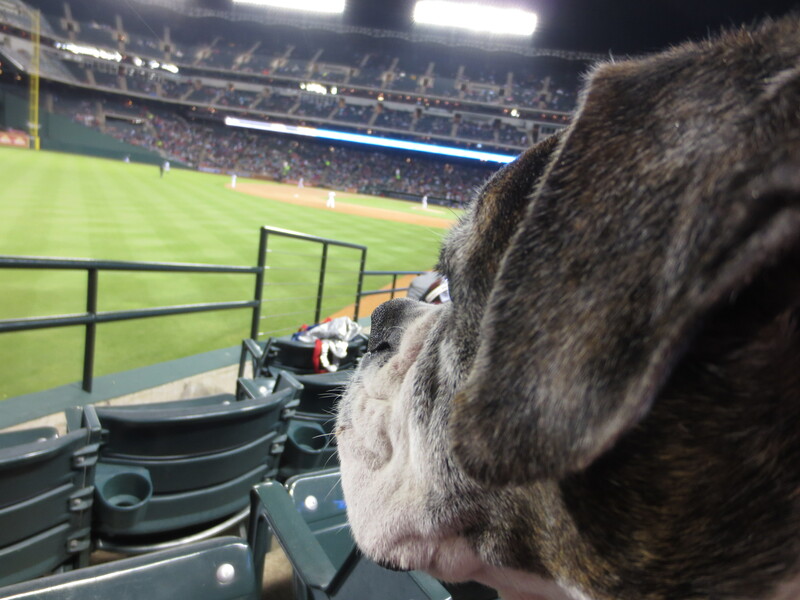 Our seats were on the third row and Rex quickly discovered the Rangers left fielder who was in close proximity to us. Rex barked and barked! I explained to him that he needed to wait until the guy in the Chicago White Sox black shirt came out and then distract him instead! The first four innings zoomed by and despite the chilly temperatures, we were having fun. We had several foul balls hit near us and each time we protected the dogs. 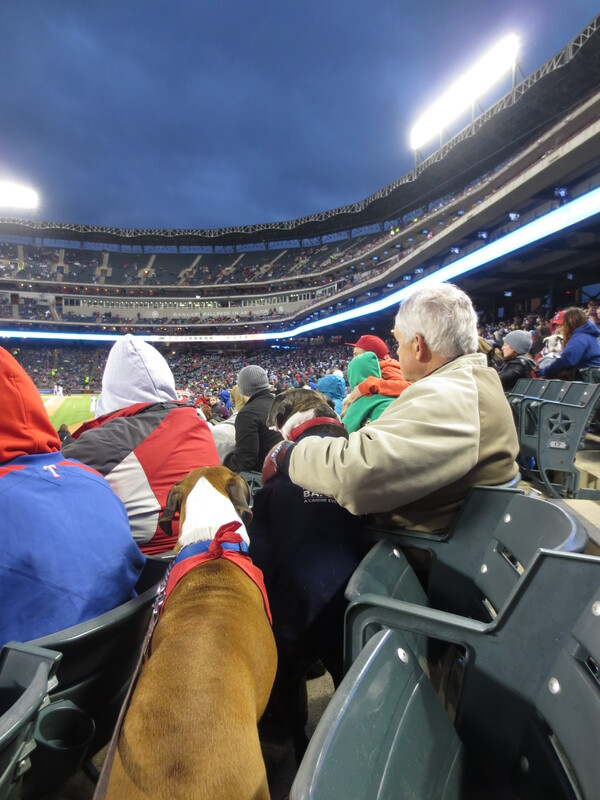 There were also the fireworks and crowd cheers when the Rangers hit a home run which would get Rex revved up again while Roxie curled up and slept. Rick was ready to leave by the end of the fifth inning and as we packed up our belongings, Chicago scored three runs. “We’re ‘outta here!” says my hubby. Rex and I clearly weren’t ready to leave but we accommodated the other two. Minutes later we were back in our warm car getting lost in the labyrinth of streets surrounding the ballpark while the dogs snored in the back seat. Would I do it again? Yes…..I assure you……We’ll be back next year!